Even a superficial accounting of its tennis credentials shows why the Sea Pines Resort traditionally ranks among the finest tennis destinations in the nation. This 4,500-acre resort/residential development on South Carolina's Hilton Head Island embraces a wealth of recreation, not the least of it the highly regarded Sea Pines Racquet Club near the landmark lighthouse at Harbour Town. Sea Pines Resort occupies the entire southern tip of Hilton Head Island, from the Atlantic westward to Calibogue Sound on the Intracoastal Waterway. Contained within is not only the racquet club but also a marina village, 54 holes of golf, an equestrian center, a fitness center, 15 miles of biking and jogging trails, a forest preserve, restaurants, shops, a luxury inn, and thousands of rental and residential properties, ranging from simple one-bedroom condominiums to luxurious beachfront homes. Remarkably, however, much of the natural landscape of pines, giant moss-draped live oaks, palmettos, and tupelo swamps remains intact. I first visited Hilton Head Island and Sea Pines in the early 1980s. Over the years I've witnessed the coming of malls, an aggravating increase in the traffic along Highway 278, which cuts through the center of the island, and more recently a second cross-island toll road constructed to relieve some of that congestion. Yet Sea Pines is now, as it was then, a tranquil haven from the chaos that reigns outside. The simple act of driving through the entrance gate is like leaving a crowded street for a quiet courtyard. Beyond that gate a two-lane road winds past a forest preserve, the pine-post fences of Lawton Stables, and the individual vegetable gardens at Heritage Farms. Barely visible villas and houses peer out from behind giant moss-bearded trees and native shrubbery. Stop signs are green; so are fire hydrants. Even now, more than four decades after Sea Pines opened, I'm still amazed at the vision behind it, especially when I reach the beach. There a boulevard of hard-packed sand extends for five miles, with little more than a boardwalk over its dunes to suggest the development within. Sea Pines as a whole has a long history of enthusiasm for tennis. For 25 years, it was the site of the annual Family Circle Cup, a WTA event whose past winners include Chris Evert, Martina Navratilova, Evonne Goolagong, Gabriela Sabatini, Stefanie Graf, and Martina Hingis. Former World No. 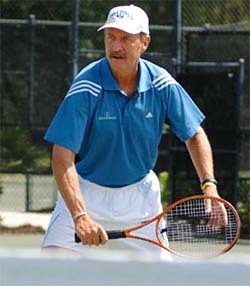 1 Stan Smith has been the resort's touring pro since the 1970s, and later co-founded the Smith-Stearns Tennis Academy, whose programs for aspiring juniors are based at the resort. All of that contributes to the tennis atmosphere of what is, on its own, a very lively and attractive tennis complex of 21 courts—one of them a stadium—laid out bordered by loblolly pines and flowering shrubbery. The one anomaly is its pro shop: a triple-wide trailer whose long-promised replacement has been delayed by recently revised plans for further enhancements to the resort. Happily the racquet club's near neighbor is the Inn at Harbour Town, an elegant 60-room hotel renowned for comfort and personable service. It adds an alternative to villa rental for those seeking the amenities of a hotel. Its location puts it steps from the courts—and, for that matter, the striking new Harbour Town golf clubhouse. And those courts continue to rank among the best tennis venues on the island. Tennis Staff. Although Stan Smith is the club's touring pro, it is director of tennis Job de Boer who handles the day-to-day operations. Born in Holland, where he studied aeronautical engineering, the 6'5" de Boer is a gifted instructor and entertainer, whose lessons often attract spectators. He began his teaching career at the Van Der Meer Tennis Center, spending eight years there before moving to Sea Pines in 1991. He oversees all the programming at the Sea Pines Racquet Club. Tennis Programs. Increasingly the weekly calendar has come to emphasize a broad range of stroke clinics, drills, and workouts supplemented by Cardio tennis workouts and fast-paced drill sessions for advanced players. 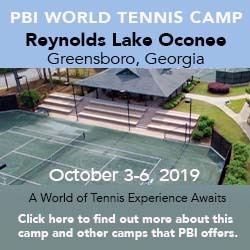 There are a handful of 10-hour weekend boot camps scheduled during the year, several additional Stan Smith super Series long weekends, and long weekend packages for groups tailored to their specific needs and availability. There are also programs for beginner and intermediate juniors, with the option for the more advanced to join the Smith-Stearn Tennis Academy. Winter can be a delightful time to visit, with attractive prices and generally good tennis weather; however, activity reaches its peak from March to October. Courts & Fees. Court fees: Guests who book rooms directly through Sea Pines Resort receive two complimentary hours of tennis daily. Additional hours are free for walk-ons or can be reserved at $16/hour. Caveat: The Sea Pines Racquet Club loses access to some or all of its courts during the RBC Heritage golf tournament in early April, so if you're planning to visit around that period, check with the pro shop for details about how tennis will be affected. Beach. Beach lines virtually the entire 12-mile-long Atlantic Coast of Hilton Head Island. Sea Pines itself borders the southernmost 5 miles of that ribbon, a broad section lined with low dunes and the sentinel pines that inspired the resort's name and packed hard enough to ride a bike on. All of the development—a collection of houses, villas, and four-to-five-story condominiums—rises behind the dune line and thus barely intrudes on the consciousness of anyone walking along the sand. The principal access occurs at the beach club, which has a little cafe and bar and boardwalks across the dunes to the beach beyond. At the tip of the island, the beach narrows as it curls around the end to South Beach—the only place on the island where you can sit on the beach and watch the sun set. The largest crowds congregate near the beach club in summer, but you only have to walk north or south to escape. Golf Courses. Tee times for any of the following courses can be reserved by calling (843) 842-8484 or (800) 955-8337. Harbour Town Golf Links: Pete Dye designed this legendary course—Golf Digest ranks it No. 9 among America's resort courses—to slice though forests of magnolias, live oaks, and pines before finishing in dramatic fashion along Calibogue Sound. Par: 70. Length: 5,019-6,916 yards. Every spring it hosts the RBC Heritage golf tournament. Ocean Course: Rebuilt in 1995 by Mark McCumber. Par: 72. Length: 5,325-6,906 yards. Heron Point by Pete Dye: Par 72. Length: 5,261-7,103 yards. Biking & Jogging Trails. Sea Pines has some 15 miles of bike trails, which makes getting around on two wheels a popular mode of transportation within the resort. Joggers often use the same paths, or head for the earthen tracks through the 605-acre Sea Pines Forest Preserve. Bike rentals are available at both racquet clubs. Fitness Center. Sea Pines has a tiny workout room with a few windows looking out at the driving range from its location in the Plantation Center. It contains some cardiovascular equipment, a Paramount exercise station and a selection of dumbbells, and its staff offers personal training and runs classes. Horseback Riding. The resort has a full-service equestrian in Lawton Stables, which also offers trail rides through Sea Pines Forest Preserve. And ... There are two marinas, one at Harbour Town, the other at South Beach, which offer sailing and fishing charters, sightseeing cruises, parasailing, jetskis, and powerboat rentals. During the summer, Sea Pines runs half-day and full-day children's programs for kids ages 4-12 under the direction of troubadour Gregg Russell, who also performs under the oak tree at Harbour Town Marina. In the fall of 2000 Sea Pines opened a long-awaited luxury 60-suite Inn at Harbour Town adjacent to the courts at the Sea Pines Racquet Club. That adds a full-service hotel to the lodging options, which otherwise range from one-bedroom condos through six-bedroom beachfront houses. There are more than 10 restaurants within Sea Pines. Seasons. Year-round though busiest during the outdoor season from June into September. Sea Pines has the 60-room European-style Inn at Harbour Town immediately adjacent to the tennis court along with its 1-to-4-bedroom villas and 3-to-7-bedroom homes. Villa and home prices vary according to season, size, location, and view. All are privately owned. By renting through Sea Pines Resort you get 2 hours of complimentary tennis per day. Villas require minimum stays of at least 3 nights (sometimes a full week in summer); homes rent only weekly. Travel Instructions. By Air: Sea Pines is 45 miles from Savannah/Hilton Head International Airport (SAV) in Georgia and 95 miles from Charleston International Airport (CHS). Major airlines serve both of those gateways. It is also possible to fly directly to Hilton Head Island Airport (HHH), on commuter service from American or US Airways Express, via Charlotte, NC. Rental cars and shuttles are available at all three airports.